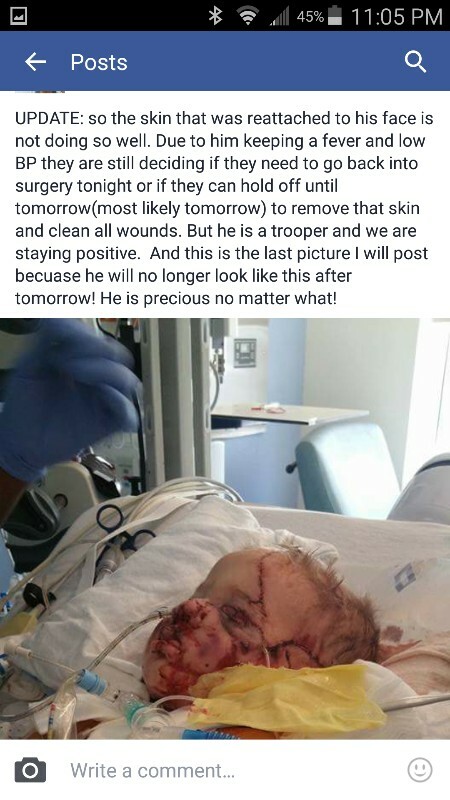 CHAPEL HILL, N.C. (WNCN) – The mother of a 21-month-old boy attacked by a ROTTWEILER Friday morning is asking for prayers for the boy’s recovery. The mother, identified as Brittany, of Statesville, said she was in Raleigh visiting friends for Thanksgiving when her son Ryder was attacked. There were two Rottweilers in the home but Brittany said only one is believed to have done the damage. “There is no ill will,” Brittany said of the dog’s owners. The dog said to have attacked Ryder lived at the home on Euston Street. The second belonged to the mother of Brittany’s friend. Both dog owners are at UNC Hospital where the toddler is expected to under go extensive surgeries. Brittany said Ryder played with the dogs throughout the day Thursday and had never shown any aggression towards the boy. “We were sitting at the kitchen table eating breakfast and he was off playing,” Brittany said. Ryder slipped out through a large doggydoor, Brittany said. “The time it happened was minute,” she said. Brittany saw the boy after the attack and said the dogs were not showing him attention at that point. “It’s a horrible feeling to find your child like that and you’re helpless,” she said. Ryder is in stable condition but is having his breathing assisted as the attacked affected his airway, according to Brittany. “He’s very little. He’s not even two yet so he has a lot ahead of him,” she said. Brittany has been welcomed to the Ronald McDonald House in Chapel Hill as she will miss work to be with her son. “Right now, the only thing we want is for Ryder to be healthy, safe, and get through this,” she said. Both Rottweilers at the home at the time of the attack will be put down. A GoFundMe page has been started to help with Ryder’s medical bills. I wonder what the mother means by "no ill will". Any dog that does this, does it on purpose. This is not an accidentally slightly too hard nip by a dog that is only trying to deflect a perceived threat or annoyance. This Rottweiler made a conscious decision to open its jaws, grip the boy's head, and chomp down with force -- multiple times. One of the articles says at least the attacking Rottweiler will be put down. That's the right thing to do with any dog that does this. I wonder whether this Rottweiler's owner was into the newest fashion of attack training the dog and thinking it would still make a safe family pet. I wish we could shut down all these people who are falsely advertising 'protection dogs' that will kill a burglar but be perfectly safe with children. Horrible! Why do people let their children play with Rottweilers? Don't go to houses with dangerous dogs and your children won't go to hospitals with life threatening injuries. I'd much rather take precautions than ask for prayers.